Gribble is the kind of artist whose work is powerful, technically brilliant, and often achieves a tour de force in its elision of imaginative and reality – but only for so long as he is inspired by his subject. His portraits, apart from some delightful images of his wife, are often flat, mundane and lack animation; but here is one vibrating with the talent and brio he brought to depictions of smugglers, fishermen, Elizabethan sailors or the crew of HMS Victory. 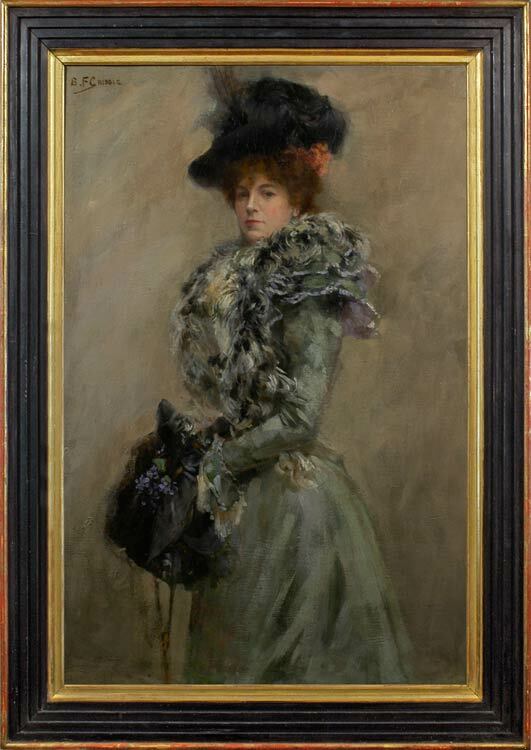 The treatment of this unidentified but striking Edwardian beauty (possibly Gribble’s sister-in-law, Eleanor Woolmer) suggests that Gribble may have been looking at Sargent – the direct gaze, the pose, the more finished painting of the face and the bravura impressionism of the dress are all reminiscent of the older painter (Portrait of Lady Helen Vincent Viscountess D’Abernon, 1904, Birmingham, Alabama). There are also suggestions of figures by the Belgian artist, Alfred Stevens; (The corner of the balcony, c1877, Art Inst. of Chicago; Portrait de femme sur une terrasse, 1882, Musée d’Orsay); and of the Russian Ilya Repin, Portrait of Baroness Varvara Iskul von Hildenbrandt, 1889. Bernard Gribble was a member of the large, talented and peripatetic Gribble family, which seems to have originated in Devon or Cornwall, and spread out across the world. It counted missionaries, naval captains and employees of the East India Company amongst its members in the 19th century, and two authors in the 20th century. Bernard’s father, Herbert Gribble, was an architect, who built the Brompton Oratory, South Kensington, as well as the Armada Memorial in Plymouth. He was his son’s first teacher, after which Bernard attended the ‘South Kensington Schools’ (the National Art Training School, and from 1896 the Royal College of Art), along with designers such as Lindsey Butterfield. He may have studied under Albert Toft, although Toft was a sculptor and modeller. Bernard married in his forties and moved to Poole, where he became an influential member of the local art society, which also boasted Henry Lamb and Augustus John amongst its members. Philip Wilson Steer, Roger Fry and LS Lowry also worked in and around Poole. He haunted the harbour at Poole, where he could study the sea and shipping at first hand, producing lively studies in charcoal and coloured chalk of yachts and other shipping. Although he painted contemporary portraits, landscapes, liners, warships, dinghies, etc., he was most noted for his marine history paintings – possibly a legacy of his education at the South Kensington Schools, where the history painter Richard Burchett (1815-75) had been head for over twenty years. Gribble’s work includes pictures of pirates, the pilgrim fathers, Spanish galleons and every imaginable naval battle throughout history. He made rigorously accurate studies of historical costumes and ships’ rigging in order to bring these scenes to authentic, dramatic life. It was remarked of him that he had painted ‘almost every historic event that took place on water, from the landing of William the Conqueror to the Scuttling of the German fleet in Scapa Flow in 1919’ – an underestimate, as his reconstruction of marine events and vessels extended to those of World War II (e.g. The Chilean destroyer ‘Serrano’). Gribble’s work was used on stamps (Sir Wilfred Grenfell on the ship Strathcona), for posters, postcards and jigsaw puzzles. He apparently produced Christmas cards for George V for several years, and was a prolific and popular illustrator of books and magazines. He exhibited at the Royal Academy, the ROI, Royal Glasgow Institute of Fine Arts and the Paris Salons, amongst others. Works in public collections include The sinking of the German fleet at Scapa Flow in 1918 (Preston Art Gallery & Museum); Market Street, Poole (The Russell Coates Museum & Art Gallery, Bournemouth); The scene on the deck of HMS Victory (Government Art Collection); A well-known subject at Southampton and Poole Harbour (Southampton City Art Gallery); Nelson boarding HMS Victory (National Maritime Museum, Cornwall, on loan from Royal Society of Marine Artists); The Mayflower’s return (Naval College, Rhode Island); and a collection of more than 140 works in Poole Museum, which includes The tea-clipper John E. Evans; HMS Victory; Poole Quay; Poole Guildhall; Galleons; A tribal class destroyer; and The Priory from Christchurch Harbour.